Vinyl jacket resists moisture, abrasion and prolonged exposure to sunlight. Sturdy reinforced blades and molded plug withstand repeated everyday use. Heavy-duty strain relief prolongs cord life. Outer jacket won't mark floors or walls. Application: Indoor; Outdoor; Cable Length: 25 ft; Number of Outlets: 1; Number of Prongs: 3. 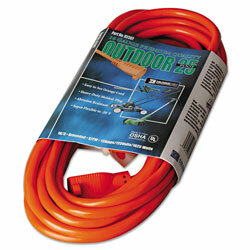 Extension and Power Cords from Coleman Cable! 577 In Stock today.